Just as Roxy thinks things cannot get any worse, her past comes back to haunt her. Jane returns to Walford, and immediately has to stop Ian from making a mess of things again. Billy erects a new sign at the gym - Ronnie’s. Roxy reports Carl’s mum rang again and plays Ronnie a voicemail. Roxy thinks it’s sad she’ll never know what happened to her son. Ronnie tells Roxy she should ring her if she feels sorry for her. Roxy stamps on Carl’s phone, smashing it. In the Arches, Phil gets a phone call from Nora White. Phil deduces she found him through the internet after Carl told his brother he was seeing a girl called Roxy Mitchell. Roxy dreads having to lie if Nora comes to Walford. Ronnie suggests Roxy leave for a few days. In the Minute Mart, Roxy’s buying juice for Amy for the journey to Aunt Sal’s when Nora arrives looking for Carl. Denise lies she’s never heard of Roxy. At home, Roxy’s hurriedly packing when the doorbell rings and a note’s slipped through the letter box from Nora. Roxy’s convinced she won’t leave them alone and arranges to meet Nora, despite Ronnie’s protests. Later, Roxy nervously approaches the café while Ronnie shows prospective members around the gym. Nora arrives and Ronnie introduces herself as Roxy, apologising for the last minute change of plan. Ronnie informs Nora she’s had no contact with Carl since they split up before Christmas. Nora thinks Kirsty is the only girl for Carl, but admits his brother thought Carl liked Roxy more than most. Ronnie tells Nora Carl often disappeared for days and once mentioned going to Manchester. Aleks interrupts and Ronnie snaps at him. Nora thinks she may have been a match for Carl after all and leaves. Roxy’s outraged that Ronnie doesn’t trust her. Ronnie insists it was her mess to clear up. At the tube station, Carl’s brother, Adam, shows Nora a photo on his phone that Carl sent him of the real Roxy. Later, Ronnie brings Dot the Basher Branning portrait of Jim. Dot suggests Ronnie should have consulted Jack before changing the gym name, and is lecturing Ronnie that she can’t forget her past when the doorbell rings. Dot lets in two police officers who inform her that her son, Nick, has died. Ian and Cindy argue when he discovers her bunking school again. Cindy flees outside, colliding with Jane, who drops a box she’s carrying with a smash. Ian’s surprised to see her; Jane explains she’s moving back from Cardiff today and staying with Masood. Jane gets a frosty reception from Shabnam. Ian wants to pay for any damage Cindy caused and finds a broken teapot in the box – their wedding present from Pauline. Ian tells Jane about Cindy’s pregnancy. Jane advises Ian to get everyone together to talk, then lends Cindy a supportive ear and offers to take her to a GP. Ian invites a suspicious Terry over. TJ’s nervous and wishes his mum was around. Terry worries that he can’t reach Bianca. At the Beales’, things are strained. After a snide comment from Ian, Terry and TJ are leaving when Jane and Cindy arrive. Cindy proudly shows off a foetal scan photo of her baby. After a call from Alice, Liam tells David Kat’s told the police she saw Alice stab Michael. David forbids Liam from informing Carol. Kat contemplates a Witness in Court leaflet and avoids Bianca. Carol thinks it odd that Kat’s let Bianca down again. Alfie makes a phone call – he needs something delivered today. David collars Kat and wonders what Janine has over her. 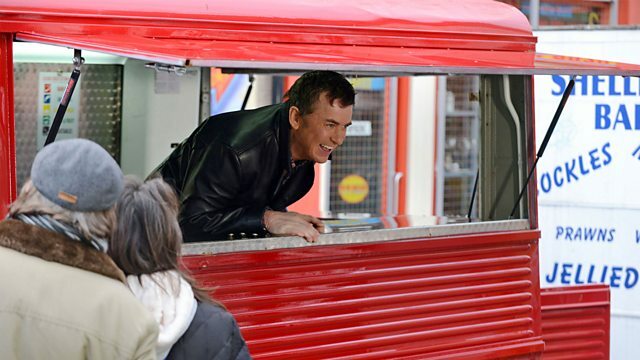 On Bridge Street, Alfie has a surprise for Kat - a red burger van, complete with stock, and a market pitch. Kat admits Alfie was right; she’s made a terrible mistake. Alfie suggests she come clean to the police. Kat’s terrified she’ll be charged with perverting the course of justice and can only hope Janine keeps her word. David’s surprised Bianca hasn’t told Terry she and Sonia are having the cancer gene test and offers to drive her, Carol and Sonia to the clinic. Carol’s unimpressed when David points out he paid for them to go private, and insists on taking a cab. Sonia confides in Dot, who’s home from hospital, about the test. Sonia’s nervous but thinks it’s better to know the truth than die suddenly like Pauline. Ronnie advises Lola to tell Peter the truth about the shoplifting and promises her £20 to hand out flyers for the gym. Abi worries she hasn’t heard back from University admissions. Jay’s distracted by Lola’s presence.